Este año, como algunos ya sabéis, celebro mi 30 aniversario pintando graffiti. Cuando empecé, recuerdo que quería hacerlo tan bien como la gente a la que admiraba y con la que pintaba; esos que me inculcaron la importancia de trabajar el estilo en el papel: las letras, su base, como deformarlas y entrelazarlas empezaron y siguen siendo en cierta manera “un problema matemático”. No importa sin son sencillas o son complejas, tienen que tener sentido y actitud. Sé que hay una parte del aprendizaje donde prácticamente todos escondemos las letras detrás de unas buenas flechas o unos andamios, que más que sostener entorpecen el fluir de la composición, pero para mí, debería ser eso, una fase y no un fin y por eso sigo buscando el ritmo perfecto. El libro no enseña mis principios, sino que se centra en lo que he dibujado en los últimos años. Muchos de estos dibujos hechos de noche, mientras trabajaba los fines de semana en el guardarropa de un local de Barcelona, para sacar dinero extra y poder viajar más a menudo. Había pensado, incluir los bocetos que he hecho con el nombre de otras personas, pero creo que eso será un proyecto para el futuro, porque aún tengo que recuperar muchos y porque en ese libro, seré yo quien diga unas palabras sobre los escritores que aparezcan y eso es mucho trabajo. Bueno, sin más, que el futuro incierto es. This year, as some of you already know, I celebrate my 30th anniversary by painting graffiti. When I started, I remember that I wanted to do it as well as the people I admired and with whom I painted; those who instilled in me the importance of working style on paper: the letters, their basis, how to deform and interlace them began and are still in a certain way "a mathematical problem" for me.” It does not matter if they are simple or complex, they have to have sense and attitude. I know that there is a part of learning where practically all of us hide the letters behind some good arrows or “scaffolding”, which more than sustain, breaks the flow of the composition, but for me, it should be that, a phase and not an end and that's why I'm still looking for the perfect beat. I have drawn a lot in these 30 years. 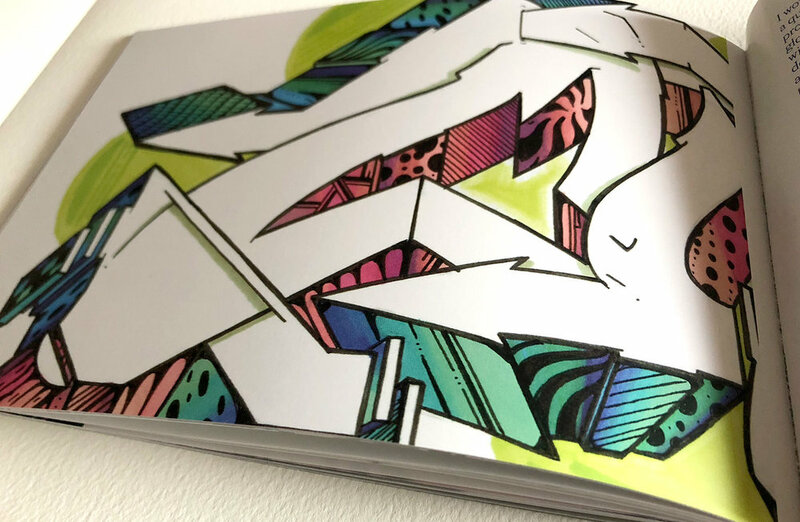 Now I regret not having kept all the sketches I've made, but I still keep many of them and that's why, after playing with the idea, I decided to take out the sketch book that accompanies the limited edition spraycan by Montana Colors. It is not a book that shows my principles, but focuses on what I have drawn in recent years. Many of them, made at night, while working on weekends in the wardrobe of a local in Barcelona, to get extra money and travel more often. I had thought about, include the sketches that I have made with the name of other people, but I think that will be a project for the future, because I still have to recover many of them and because in that book, I will be the one who says a few words about the writers that appear and that is a lot of work.